Paludisme "a word derived from Latin palus meaning swamp" or Malaria " a word derived from Italian mala'ria meaning bad air", designed by the bad air from swamps, is an infectious disease caused by a parasite of the genus Plasmodium transmitted by female mosquitoes of the genus Anopheles generating millions of deaths each year. Biological membranes have a major role in cells invasion by Malaria parasites. Phosphatidylserine and phosphatidylinositol are essential for the invasion of erythrocytes by Plasmodium. Plasmodium binds to the erythrocyte membrane via glycolipids. Cholesterol is responsible for the uptake of host proteins and maintenance of intracellular parasitophorous vacuolar membrane. Malaria parasites invade red blood cells by binding to multiple membrane receptors at the level of the spectrin, band 3, actin, glycophorin, band 4.1, band 4.2, aquaporin-1, band 7, and ankyrin. Parasitic proteins such as the reticulocyte-binding like family bind to the membrane erythrocytic proteins and play a major role in the mechanisms of invasion of red blood cells by Plasmodium. Susceptibility to Plasmodium invasion is linked to the terminal stages of the differentiation of red blood cells. This review highlights the complex interactions between biological membranes and malaria parasites. Keywords: Paludisme, Malaria, Plasmodium, Pathogenesis, Membranes, Red Blood Cells, Theranostic. © 2019 Moumaris et al. Malaria is an infectious parasitic disease infecting about 500 million people and causing about 3 million deaths each year, according to the World Health Organization. About 3.3 billion people worldwide are exposed to malaria [1Snow RW, Guerra CA, Noor AM, Myint HY, Hay SI. The global distribution of clinical episodes of Plasmodium falciparum malaria. Nature 2005; 434(7030): 214-7. [http://dx.doi.org/10.1038/nature03342] [PMID: 15759000] , 2Hay SI, Guerra CA, Gething PW, et al. A world malaria map: Plasmodium falciparum endemicity in 2007. PLoS Med 2009; 6(3): e1000048. [http://dx.doi.org/10.1371/journal.pmed.1000048] [PMID: 19323591] ]. Descriptions of the symptoms of this disease are found in the papyrus of Ebers and at Hippocrates [3Ebbell B, Banov L. The Papyrus Ebers: The greatest Egyptian medical document 1937.-5Ambroise TP, Carnevale P, Felix H, Mouchet J. Le Paludisme 1984.]. Alphonse Laveron discovered the parasite Plasmodium in the erythrocytes of patients with malaria fever [6Laveran A. Description d’un nouveau parasite découvert dans le sang des malades atteints de fièvre palustre. C R Acad Sci Paris 1881; 93: 627-30.-8Laveran A. Note sur un nouveau parasite trouvé dans le sang de plusieurs malades atteints de fièvre palustre. Bull Acad Med Paris 1880; 9: 1235-6.]. Malaria in humans is caused by four species of the genus Plasmodium which are Plasmodium falciparum, Plasmodium vivax, Plasmodium malariae and Plasmodium ovale. Plasmodium vivax and Plasmodium ovale emerge at the Pliocene. Plasmodium falciparum occurs in the Pleistocene. Plasmodium malariae is common to humans and chimpanzees [9Garnham PCC. Malaria parasites and other haemosporidia 1966., 10Mattingly PF. Origins and evolution of the human malarias: The role of the vector. Parassitologia 1973; 15(3): 169-72. [PMID: 4153823] ]. Plasmodium recognizes specific receptor sites on the surface of cells and enters these cells to develop. The nature of cells seems to influence the mechanisms of recognition or interaction between the parasite and its host cells. How can the structure of cells intervene in parasite invasion? The genus Plasmodium of the family of Plasmodiidae of the Haemosporina suborder of the Telosporea class is characterized by schizogonies in the host receiver and sporogonies in the vector insect. When the Anopheles bites a malarious subject, it ingests Plasmodium gametocytes. Once entering the mosquitoes, gametocytes differentiate into gametes. The female gametocyte, macrogametocytes, becomes a macrogamete in the mosquito's stomach. The male gametocyte, microgametocytes, gives microgametes. The microgamete and macrogamete perform sexual reproduction to produce an ookinete. Between the intestinal epithelium and the basement membrane, the ookinete is surrounded by a cystic membrane and gives an oocyst. After a series of mitosis, the oocyst gives sporoblasts which produce sporozoites by cryptomitosis. The sporozoites migrate to the salivary glands of the mosquito [11Sinden RE. 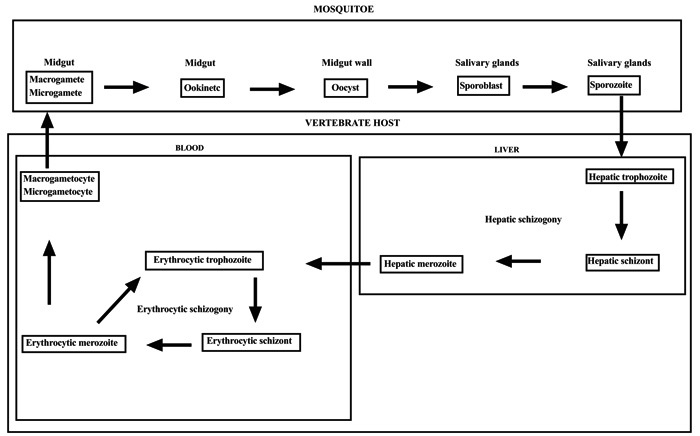 Sexual development of malarial parasites in their mosquito vectors. Trans R Soc Trop Med Hyg 1981; 75(1): 171-2. 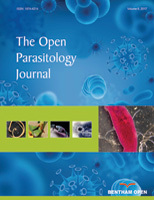 [http://dx.doi.org/10.1016/0035-9203(81)90058-4] [PMID: 6115489] , 12Sterling CR, Aikawa M. A comparative study of gametocyte ultrastructure in avian haemosporidia. J Protozool 1973; 20(1): 81-92. [http://dx.doi.org/10.1111/j.1550-7408.1973.tb06008.x] [PMID: 4632266] ]. During a blood meal, the infected anopheline female mosquito inoculates sporozoites in the capillaries of the vertebrates host. About 1 to 30 minutes after their inoculation, the sporozoites infect the hepatocytes. After the ring and trophozoite stages, the sporozoite undergoes a pre-erythrocytic asexual division process, schizogony, to produce a schizont that releases 16-32 daughter merozoites invading blood cells [13Rosenberg R, Wirtz RA, Schneider I, Burge R. An estimation of the number of malaria sporozoites ejected by a feeding mosquito. Trans R Soc Trop Med Hyg 1990; 84(2): 209-12. [http://dx.doi.org/10.1016/0035-9203(90)90258-G] [PMID: 2202101] , 14Krotoski WA, Krotoski DM, Garnham PC, et al. Relapses in primate malaria: Discovery of two populations of exoerythrocytic stages. Preliminary note. BMJ 1980; 280(6208): 153-4. [http://dx.doi.org/10.1136/bmj.280.6208.153-a] [PMID: 6766771] ]. The erythrocytic cycle is 48 hours. It is an endocytosis with 3 stages: i) attachment of merozoite to the red blood cell ii) invagination of the red blood cell membrane iii) internalization of the parasite in the RBC, it's a trophozoite phase. The trophozoite phase produces a parasitophorous vacuole where schizogony generates several merozoite daughter cells [15Aikawa M. Parasitological review. Plasmodium: The fine structure of malarial parasites. Exp Parasitol 1971; 30(2): 284-320. [http://dx.doi.org/10.1016/0014-4894(71)90094-4] [PMID: 4399774] ]. Merozoites are released into the blood by the bursting of their host cells to start a new cycle [16Bray RS, Garnham PC. The life-cycle of primate malaria parasites. Br Med Bull 1982; 38(2): 117-22. [http://dx.doi.org/10.1093/oxfordjournals.bmb.a071746] [PMID: 7052190] , 17Aikawa M. Variations in structure and function during the life cycle of malarial parasites Bull World Health Organ 1977; 55: 139-56.]. Some merozoites become microgametocytes or macrogametocytes. It is the sexual gametocytogony phase (Figs. 1 and 2 ). The erythrocytic stages are responsible for the pathologies and symptoms of malaria including fevers, anemias, lesions in the organs (spleen, liver, brain, kidneys), and severe brain disease. The fever is related to the bursting of the parasitic RBC and the release into the blood circulation of the hemozoin, parasitic pigment, and various pyrogenic substances. The bursting of the schizonts and the liberation of the merozoites could partly explain the erythrocyte destruction. Hemolysis also affected the infected and non-infected red blood cells, with some infested cells being eliminated by the spleen [18Dei-Cas E, Maurois P, Vernes A. Les mécanismes des manifestations pathologiques du paludisme sont nombreux et complexes; ils impliquent, entre autres, des altérations érythrocytaires et des perturbations humorales, notamment immunologiques. Physiopathologie du paludisme. Med Sci (Paris) 1986; 2: 322-30. [http://dx.doi.org/10.4267/10608/3513] ]. An immune response with complement participation would also play a role in hemolysis. The hemolytic activity of the mononuclear phagocytic system of the spleen especially and autoimmunity are largely responsible for the destruction of healthy red blood cells, which are phagocytosed and destroyed at the same time as the parasitized erythrocytes [19Weatherall DJ, Abdalla S, Pippard MJ. The anaemia of Plasmodium falciparum malaria. Ciba Found Symp 1983; 94: 74-97. [PMID: 6341004] -22Weidanz WP. Malaria and alterations in immune reactivity. Br Med Bull 1982; 38(2): 167-72. [http://dx.doi.org/10.1093/oxfordjournals.bmb.a071754] [PMID: 7052198] ]. For self-immunizing hemolysis, which may play an important role, for example, in rabbits infected by Plasmodium berghei ANKA, Topley et al. discovered a complement on the surface of non-parasitized erythrocytes [23Topley E, Knight R, Woodruff AW. The direct antiglobulin test and immunoconglutinin titres in patients with malaria. Trans R Soc Trop Med Hyg 1973; 67(1): 51-4. [http://dx.doi.org/10.1016/0035-9203(73)90319-2] [PMID: 4591219] , 24Zuckerman A. Recent studies on factors involved in malarial anemia. Mil Med 1966; 131(9): 1201-16. [http://dx.doi.org/10.1093/milmed/131.suppl_9.1201] [PMID: 4957827] ]. Malaria is responsible for hyperreactivity of the reticuloendothelial system, which leads to the lysis of even non-parasitic erythrocytes [25Ratnoff OD, Forbes CD. Disorders of Hemostasis 1984., 26Williams WJ, Beutler E, Erslev AJ, Lichtman MA. Hematology 1983.]. The hemolysis observed during infestation could be explained by an increased serum phospholipase A2 activity as demonstrated in Plasmodium falciparum malaria [27Vadas P, Taylor TE, Chimsuku L, et al. Increased serum phospholipase A2 activity in Malawian children with falciparum malaria. Am J Trop Med Hyg 1993; 49(4): 455-9. [http://dx.doi.org/10.4269/ajtmh.1993.49.455] [PMID: 8214274] ]. Phospholipase A2 is a proinflammatory enzyme whose expression is induced by Tumor Necrosis Factor (TNFα) that is inhibited in vitro by the fatty acids produced. In response to this erythrocytic depletion, hematopoiesis releases reticulocytes into the general blood circulation. Moumaris et al. demonstrated that during the first 4 days of the infection of C57BL/6 mice by Plasmodium berghei ANKA, the appearance of a subpopulation of young erythrocytes was invaded preferentially by Plasmodium berghei ANKA, which seems to play a key role in the initiation of the pathology of cerebral malaria. These young erythrocytes observed during the early period of infestation are the result of hemolysis. As a matter of fact, three days after the infestation, the hematocrit begins to decrease. The influx of newly produced blood coming from the spleen and from bone marrow partially compensated the hemolytic activity [28Moumaris M, Sestier C, Miltgen F, Halbreich A, Gentilini M, Sabolovic D. Effect of fatty acid treatment in cerebral malaria-susceptible and nonsusceptible strains of mice. J Parasitol 1995; 81(6): 997-9. [http://dx.doi.org/10.2307/3284055] [PMID: 8544078] ]. Various pathogenic mechanisms of cerebral malaria are proposed: i) the sequestration of infected red blood cells in blood vessels and brain tissue ii) secretion of multiple mediators as cytokines and free radicals iii) alteration of capillary permeability which leads to microhemorrhages and cerebral edema [29Curfs JH, Hermsen CC, Meuwissen JH, Eling WM. Immunization against cerebral pathology in Plasmodium berghei-infected mice. Parasitology 1992; 105(Pt 1): 7-14. [http://dx.doi.org/10.1017/S0031182000073625] [PMID: 1437278] -32Neill AL, Hunt NH. Pathology of fatal and resolving Plasmodium berghei cerebral malaria in mice. Parasitology 1992; 105(Pt 2): 165-75. [http://dx.doi.org/10.1017/S0031182000074072] [PMID: 1280805] ]. During sequestration, infected red blood cells adhere to healthy red blood cells forming rosettes. 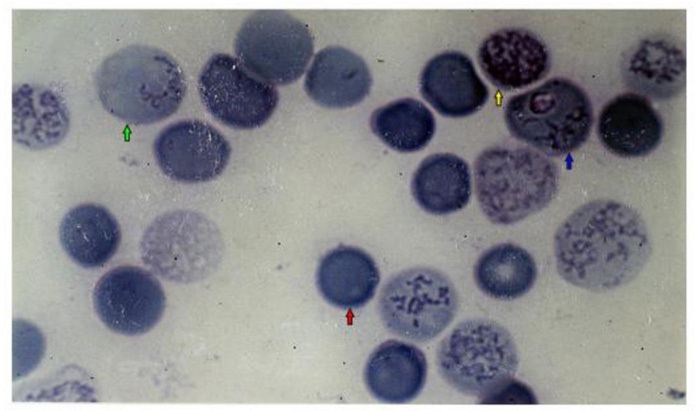 This rosetting phenomenon is responsible for severe malaria described in Plasmodium falciparum and Plasmodium chabaudi [33Wahlgren M, Carlson J, Udomsangpetch R, Perlmann P. Why do Plasmodium falciparum-infected erythrocytes form spontaneous erythrocyte rosettes? Parasitol Today (Regul Ed) 1989; 5(6): 183-5. [http://dx.doi.org/10.1016/0169-4758(89)90141-5] [PMID: 15463207] ]. Plasmodium falciparum proteins exhibit an affinity for receptors located on the surface of the capillary endothelial cells, that results in sequestration of the parasitized RBC on the endothelium of the deep capillaries. This sequestration appears to be one of the main causes of microcirculatory obstruction and cerebral malaria [34Raventos-Suarez C, Kaul DK, Macaluso F, Nagel RL. Membrane knobs are required for the microcirculatory obstruction induced by Plasmodium falciparum-infected erythrocytes Proc Natl Acad Sci U S A 1985; 82: 3829-3.-40Udeinya IJ, Akogyeram CO. Induction of adhesiveness in human endothelial cells by Plasmodium falciparum-infected erythrocytes. Am J Trop Med Hyg 1993; 48(4): 488-95. [http://dx.doi.org/10.4269/ajtmh.1993.48.488] [PMID: 8480856] ]. This interaction involves: i) receptors expressed on the surface of host endothelial cells as CD35, Complement Receptor 1 (CR1), Intercellular Adhésion Molecule 1 (ICAM-1), CD36 and CD31 ii) parasitic adhesion proteins as Plasmodium falciparum erythrocyte membrane protein (PfEMP1) iii) ABO blood group antigens expressed at the surface area of uninfected red blood cells. Blood group O, red blood cells deficient in sialic acid residues or in glycophorin, and RBC variant to spectrin or to band 4.1 in elliptocytosis, are resistant to invasion by Plasmodium falciparum and to severe malaria [41Weatherall DJ. Genetic variation and susceptibility to infection: The red cell and malaria. Br J Haematol 2008; 141(3): 276-86. [http://dx.doi.org/10.1111/j.1365-2141.2008.07085.x] [PMID: 18410566] -47Panda AK, Panda M, Tripathy R, Pattanaik SS, Ravindran B, Das BK. Complement receptor 1 variants confer protection from severe malaria in Odisha, India. PLoS One 2012; 7(11): e49420. [http://dx.doi.org/10.1371/journal.pone.0049420] [PMID: 23152904] ]. Sickle cell disease confers host protection to malaria. This protection is a tolerance to Plasmodium through the Nuclear factor erythroid 2-related factor 2/heme oxygenase 1 (Nrf2/HO-1) system. Mice expressing sickle Hemoglobin (Hb) are not susce-ptible to cerebral malaria. Sickle Hb inhibits activation of CD8+ T cells recognizing antigens of Plasmodium [48Ferreira A, Marguti I, Bechmann I, et al. Sickle hemoglobin confers tolerance to Plasmodium infection. Cell 2011; 145(3): 398-409. [http://dx.doi.org/10.1016/j.cell.2011.03.049] [PMID: 21529713] ]. The sequestration of parasitized erythrocytes in the deep capillaries reduced perfusion, inducing a multivisceral suffering. This phenomenon is also observed in the infection of mice by Plasmodium yoelii nigeriensis or by Plasmodium yoelii 17XL [49Sharma MR, Sharma MC, Tripathi LM, Pandey VC, Maitra SC. Neuropathological studies on Plasmodium yoelii nigeriensis-induced malaria in mice. J Comp Pathol 1994; 110(3): 313-7. [http://dx.doi.org/10.1016/S0021-9975(08)80285-X] [PMID: 8040397] , 50Kaul DK, Nagel RL, Llena JF, Shear HL. Cerebral malaria in mice: Demonstration of cytoadherence of infected red blood cells and microrheologic correlates. Am J Trop Med Hyg 1994; 50(4): 512-21. [http://dx.doi.org/10.4269/ajtmh.1994.50.512] [PMID: 8166359] ]. Mice neuro-malarial disease results from an immune response in which cytokines like TNFα increased the expression of adhesion molecules of endothelial cells to monocytes. The result is an accumulation of monocytes in the cerebrovascular system [51Aggarwal BB, Eessalu TE, Hass PE. Hass PE. Characterization of receptors for human tumour necrosis factor and their regulation by gamma-interferon Nature 1985; 318: 665-7.-57Grau GE, Lou JN. Experimental cerebral malaria: Possible new mechanisms in the TNF-induced microvascular pathology. Soz Praventivmed 1995; 40(1): 50-7. [http://dx.doi.org/10.1007/BF01615662] [PMID: 7900436] ]. However, the immune response cannot be the sole cause of cerebral malaria; other elements interfere to develop this pathology [28Moumaris M, Sestier C, Miltgen F, Halbreich A, Gentilini M, Sabolovic D. Effect of fatty acid treatment in cerebral malaria-susceptible and nonsusceptible strains of mice. J Parasitol 1995; 81(6): 997-9. [http://dx.doi.org/10.2307/3284055] [PMID: 8544078] ]. The erythrocytes consist of a plasma membrane enclosing hemoglobin and the enzymes necessary to maintain the integrity of the plasma membrane and gaseous transport of oxygen and carbon dioxide. Circulating red blood cells are anucleated and do not synthesize new surface molecules. The plasma membrane is formed of a continuous double layer of 40% lipid molecules in which 52% various proteins are integrated. An 8% carbohydrates from cell-coat (glycocalyx) covalently bound to proteins and lipids membrane. The carbohydrates are located on the outer side of the cells and play a role in the relationships between cells. The erythrocyte membrane carries the determinants of blood groups. The infected erythrocyte is constituted of a complex system of membranes: i) the trilaminar membrane of the merozoites ii) the membranes of organelles of merozoite as Golgi apparatus, endoplasmic reticulum, primary lysosomes, mitochondria, micronemes, and rhoptries iii) the Parasitophorous Vacuolar Membrane (PVM) and iv) the erythrocyte membrane. The life-cycle of malaria parasites (the description is in the text). Erythrocyte invasion by Plasmodium merozoite. A- Merozoite attachment. Reticulocyte Binding-Like Family (RBL) proteins play a major role in the mechanisms of invasion of erythrocyte and reticulocyte. They are several parasitic ligands such as the high molecular mass Rhoptry Protein (RHOP-H), the Plasmodium falciparum rhoptry neck protein (PfAARP), the Serine Repeat Antigen (SERA), the Mature parasite-infected Erythrocyte Surface Antigen (MESA), the Erythrocyte Binding Antigen (EBA) and the Merozoite Surface Protein (MSP-1). 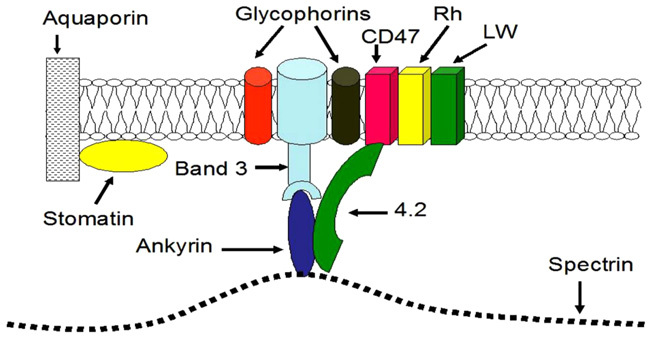 Plasmodium ligands bind multiple receptors on the membrane of the erythrocyte such as spectrin, band 3, actin, glycophorin, band 4.1, band 4.2, aquoporin-1, band 7 and ankyrin. B- Merozoite reorientation and junction formation. C- Parasitophorous vacuole formation and invasion. D- Pinching off the junction and shedding of surface coat. E- Ring stage. A membrane is composed of a bilayer of amphiphilic lipids which consist of phospholipids and glycolipids. The plasma membrane consists of 40% lipids including 55% phospholipids, 25% cholesterol, and 20% glycolipids. Membrane glycolipids include several groups including glyceroglycolipids, glycosphingolipids, and glycophosphatidylinositols. The plasma membrane contains five major phospholipids which are Phosphatidyl Choline (PC), Sphingomyelin (SPH), Phosphatidyl-Serine (PS), Phosphatidyl Ethanolamine (PE) and Phosphatidylinositol (PI). The phospholipids are organized in a double layer. In each layer, the hydrophilic polar heads are directed outwards of the membrane and the hydrophobic aliphatic queues are directed inwards of the membrane. The distribution of lipids in the cell membrane is asymmetric. The majority of phosphatidylcholines and sphingolipids are located in the outer leaflet of the plasma membrane. The majority of phosphatidylethanolamines, phosphatidylinositols and all phosphatidylserines are located in the inner leaflet of the plasma membrane. The outer layer of the erythrocyte membrane contains 80% of the sphingomyelins and phosphatidylcholines compared to only 20% of the phosphatidylethanolamines. The inner layer contained all phosphatidylserines, 80% of phosphatidyl-ethanol-amines, the majority of phosphatidylino-sitols and the remainder of choline phospholipids. Cholesterols are located in equal proportions in the outer leaflet and the inner leaflet of the plasma membrane [58Kleinfeld AM. Current views of membrane structure. Curr Top Membr Transp 1987; 29: 1-27. [http://dx.doi.org/10.1016/S0070-2161(08)60041-6] , 59Op den Kamp JA. Lipid asymmetry in membranes. Annu Rev Biochem 1979; 48: 47-71. [http://dx.doi.org/10.1146/annurev.bi.48.070179.000403] [PMID: 382989] ] (Table 1). This asymmetry is linked to a membrane protein, flipase ATP-dependent. This flipase displaces the aminophospholipids (PS, PE) from the outer leaflet to the inner leaflet [60Seigneuret M, Devaux PF. ATP-dependent asymmetric distribution of spin-labeled phospholipids in the erythrocyte membrane: Relation to shape changes. Proc Natl Acad Sci USA 1984; 81(12): 3751-5. [http://dx.doi.org/10.1073/pnas.81.12.3751] [PMID: 6587389] ]. Nevertheless, the transfer of choline phospholipids (PC, SPH) occurs according to simple diffusion [61Zachowski A, Fellman P, Devaux PF. Absence of transbilayer diffusion of spin-labeled sphingomyelin on human erythrocytes. Comparison with the diffusion of several spin-labeled glycerophospholipids. Biochim Biophys Acta 1985; 815(3): 510-4. [http://dx.doi.org/10.1016/0005-2736(85)90380-3] [PMID: 3995040] ]. The asymmetry of the membrane appears to be important in cell recognition. In fact, if the distribution of the phospholipids is disturbed in the membrane cells, phosphatidylserine can be found in the outer leaflet, then the cells become easily recognizable by the macrophages [62Schroit AJ, Madsen JW, Tanaka Y. In vivo recognition and clearance of red blood cells containing phosphatidylserine in their plasma membranes. J Biol Chem 1985; 260(8): 5131-8. [PMID: 3988747] ]. Although the physiological function of lipid asymmetry is almost unknown, there are membrane-bound enzymes that utilize this asymmetry, for example, protein kinase C binds to the membrane by interaction with phosphatidylserine being indispensable to its activity. Changes in fatty acid composition by influencing this asymmetry disrupt membrane functions such as transport, receptor-effector coupling, and cell recognition would be a key trigger for cerebral malaria. Glycolipids are mostly located in the outer layer of the membrane, and their glucidic residues are exposed to the surface of cells, suggesting that they play a role in the cell's interactions with its environment [63Simões AP, Roelofsen B, Op den Kamp JA. Lipid compartmentalization in erythrocytes parasitized by Plasmodium spp. Parasitol Today (Regul Ed) 1992; 8(1): 18-21. [http://dx.doi.org/10.1016/0169-4758(92)90305-L] [PMID: 15463520] -65Agranoff BW, Aprison MH. Advances in neurochemistry 1982. [http://dx.doi.org/10.1007/978-1-4684-7541-8] ]. Lipids directly affect the physiological properties of membranes and their integrity is essential in the invasion process of the parasite. The intraerythrocytic schizogony of the parasite is accompanied by neosynthesis of a significant amount of Phospholipid (PL) necessary for the biogenesis of these membranes, which leads to a considerable increase in PL content (+500%). After the development of Plasmodium, the PL composition of the parasite appears distinct from the erythrocyte host, with PC and PE being the major Plasmodium PLs [66Holz GG Jr. Lipids and the malarial parasite. Bull World Health Organ 1977; 55(2-3): 237-48. [PMID: 412602] , 67Vial HJ, Ancelin ML, Philippot JR, Thuet MJ. Biosynthesis and dynamics of lipids in Plasmodium-infected mature mammalian erythrocytes. Blood Cells 1990; 16(2-3): 531-55. [PMID: 2257325] ]. The parasite can synthesize phospholipids, the erythrocyte renews its phospholipids by acylation of plasma lysophopholipids or by exchange with serum lipoproteins, but the parasite as its erythrocyte host can not synthesize fatty acids. A plasma intake is then necessary to the structuring of the new parasitic membranes. Plasmodium and erythrocyte host lack certain enzymes for the synthesis and degradation of the fatty acid [68Renooij W, Van Golde LM, Zwaal RF, Van Deenen LL. Topological asymmetry of phospholipid metabolism in rat erythrocyte membranes Evidence for flip-flop of lecithin Eur J Biochem 1976; 61: 53-8.-70The Red Blood Cell New York: Douglas Surgenor 1974.]. Fatty acids are necessary for the development of Plasmodium membranes. The nature of these fatty acids characterized by carbon chain length and unsaturation plays a role in the evolution of parasitemia. The incorporation of fatty acids is very active in the infected erythrocyte. There is undoubtedly a relationship between dietary lipids and the properties of parasitized erythrocytes and their structures; any deficiency of essential fatty acids for the structuring of this complex system of membranes merely limits the multiplication of the parasite [71Popp-Snijders C, Schouten JA, de Jong AP, van der Veen EA. Effect of dietary cod-liver oil on the lipid composition of human erythrocyte membranes. Scand J Clin Lab Invest 1984; 44(1): 39-46. [http://dx.doi.org/10.3109/00365518409083785] [PMID: 6701449] -73Durand G, Guesnet P, Desnoyers F, Pascal G. Effects of α-linolenic acid deficiency on the morphology and fatty acid composition of rat erythrocytes. Prog Lipid Res 1986; 25: 395-400. [http://dx.doi.org/10.1016/0163-7827(86)90079-2] ] but it remains to be understood why administration to Swiss mice of large amounts of fatty acids solubilized in tween 20 prevents the multiplication of Plasmodium vinckei petteri or Plasmodium yoelii nigeriensis [74Krugliak M, Deharo E, Shalmiev G, Sauvain M, Moretti C, Ginsburg H. Antimalarial effects of C18 fatty acids on Plasmodium falciparum in culture and on Plasmodium vinckei petteri and Plasmodium yoelii nigeriensis in vivo. Exp Parasitol 1995; 81(1): 97-105. [http://dx.doi.org/10.1006/expr.1995.1097] [PMID: 7628573] ]. The nervous system is the organ that represents the highest concentration of lipids immediately after the fat masses. Dietary fatty acids and more particularly polyunsaturated fatty acids have a direct influence on the composition of the brain membranes and their functioning. During cerebral malaria of mice, polyunsaturated fatty acids deficiency involves neurological abnormalities [75Carlson SE, Carver JD, House SG. High fat diets varying in ratios of polyunsaturated to saturated fatty acid and linoleic to linolenic acid: A comparison of rat neural and red cell membrane phospholipids. J Nutr 1986; 116(5): 718-25. [http://dx.doi.org/10.1093/jn/116.5.718] [PMID: 2871142] -78Holman RT, Johnson SB, Hatch TF. A case of human linolenic acid deficiency involving neurological abnormalities. Am J Clin Nutr 1982; 35(3): 617-23. [http://dx.doi.org/10.1093/ajcn/35.3.617] [PMID: 6801965] ]. Membrane proteins are determined according to an international nomenclature by reference to their electrophoretic migration. Electrophoresis sizing indicated that the membranes cells contain 7 to 10 major proteins components, which are spectrin, ankyrin, band IV.1a, band IV.1b, actin, aquaporin, band III, and glycophorins. Maturation of reticulocytes to erythrocytes is associated with a decrease in protein synthesis and so are the membrane proteins. The loss of protein synthesizing activity in the maturing reticulocyte involves the loss of polyribosomal material. Reticulocytes also lose hemoglobin and lipids synthesis during maturation [94Chang H, Langer PJ, Lodish HF. Asynchronous synthesis of erythrocyte membrane proteins. Proc Natl Acad Sci USA 1976; 73(9): 3206-10. [http://dx.doi.org/10.1073/pnas.73.9.3206] [PMID: 1067613] -99Glowacki ER, Millette RL. Polyribosomes and the loss of hemoglobin synthesis in the maturing reticulocyte. J Mol Biol 1965; 11: 116-27. [http://dx.doi.org/10.1016/S0022-2836(65)80177-2] [PMID: 14255752] ]. There are integral and intrinsic proteins like band III, glycophorins, and aquaporin which are integrated into the phospholipid bilayer of the membrane, detergent or solvent are used to extract them. There are peripheral and extrinsic proteins like spectrin, actin, ankyrin, band IV.1a, and band IV.1b which attach to the lipid bilayer and to membrane proteins. They provide enzymatic, structural, transport, communication, adhesion, and intercellular recognition activities. Membrane skeletal proteins are peripheral structural proteins located on the cytoplasmic surface of the membrane. They are responsible for the shape of red blood cells and represent 60% of the membrane proteins [100Fairbanks G, Steck TL, Wallach DF. Electrophoretic analysis of the major polypeptides of the human erythrocyte membrane. Biochemistry 1971; 10(13): 2606-17. 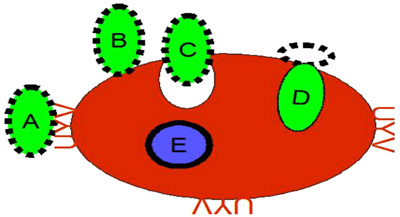 [http://dx.doi.org/10.1021/bi00789a030] [PMID: 4326772] , 101Alberts B. Molecular biology of the cell 2015.]. Reticulocyte Binding-Like family (RBL) proteins play a major role in the mechanisms of invasion of erythrocyte and reticulocyte by Plasmodium. To invade erythrocytes, Plasmodium uses multiple receptors at the level of the spectrin, band 3, actin, glycophorin, band 4.1, band 4.2, aquaporin-1, band 7, and ankyrin. Glycophorin is the major receptor for Plasmodium falciparum. The Duffy glycoprotein is the receptor for Plasmodium vivax [102Pasvol G, Wainscoat JS, Weatherall DJ. Erythrocytes deficiency in glycophorin resist invasion by the malarial parasite Plasmodium falciparum. Nature 1982; 297(5861): 64-6. [http://dx.doi.org/10.1038/297064a0] [PMID: 7040988] -107Méndez D, Hernáez ML, Kamali AN, Diez A, Puyet A, Bautista JM. Differential carbonylation of cytoskeletal proteins in blood group O erythrocytes: Potential role in protection against severe malaria. Infect Genet Evol 2012; 12(8): 1780-7. [http://dx.doi.org/10.1016/j.meegid.2012.06.013] [PMID: 22771625] ]. Some Plasmodium falciparum binding receptors require erythrocytic sialic acid mostly bound to glycophorins, but others are independent of sialic acid on the erythrocyte membrane [108Mitchell GH, Hadley TJ, McGinniss MH, Klotz FW, Miller LH. Invasion of erythrocytes by Plasmodium falciparum malaria parasites: Evidence for receptor heterogeneity and two receptors. Blood 1986; 67(5): 1519-21. [PMID: 3516259] ]. Trypsin cleaves glycoproteins and neuraminidase cleaves sialic acids from sialoglycoproteins. Treatment of red blood cells with trypsin or neuraminidase reduces in vitro invasion of erythrocytes by Plasmodium falciparum [109Jungery M, Pasvol G, Newbold CI, Weatherall DJ. A lectin-like receptor is involved in invasion of erythrocytes by Plasmodium falciparum. Proc Natl Acad Sci USA 1983; 80(4): 1018-22. [http://dx.doi.org/10.1073/pnas.80.4.1018] [PMID: 6341986] ] (Table 2). The transmembrane glycoproteins of the red blood cells as glycophorin and band 3, are implicated in the Plasmodium falciparum invasion [110Okoye VC, Bennett V. Plasmodium falciparum malaria: Band 3 as a possible receptor during invasion of human erythrocytes. Science 1985; 227(4683): 169-71. [http://dx.doi.org/10.1126/science.3880920] [PMID: 3880920] ]. There is receptor heterogeneity for invasion by Plasmodium, therefore, Plasmodium falciparum can invade RBC deficient in glycophorin A and glycophorin B (MkMk) [111Hadley TJ, Miller LH, Haynes JD. Recognition of red cells by malaria parasites: The role of erythrocyte-binding proteins. Transfus Med Rev 1991; 5(2): 108-22. [http://dx.doi.org/10.1016/S0887-7963(91)70198-3] [PMID: 1821642] ]. Treatment of erythrocytes by pronase inhibits in vitro invasion of erythrocytes by Plasmodium falciparum [112Friedman MJ, Fukuda M, Laine RA. Evidence for a malarial parasite interaction site on the major transmembrane protein of the human erythrocyte. Science 1985; 228(4695): 75-7. [http://dx.doi.org/10.1126/science.3883494] [PMID: 3883494] ]. The digestion of membrane proteins by chymotrypsin, which cleaves band 3, integrally increases the invasion process suggesting that during the invasion process, digestion of band 3 with protease induces membrane destabilization at the site parasite insertion and leads to the formation of the parasitophorous vacuole [113McPherson RA, Donald DR, Sawyer WH, Tilley L. Proteolytic digestion of band 3 at an external site alters the erythrocyte membrane organisation and may facilitate malarial invasion. Mol Biochem Parasitol 1993; 62(2): 233-42. [http://dx.doi.org/10.1016/0166-6851(93)90112-B] [PMID: 8139616] ] (Table 2). During erythropoiesis, synthesis of the bulk of the spectrin and actin polypeptides is completed before that of the major transmembrane glycoproteins. Synthesis of the glycoproteins ceases before that of several minor proteins found on the inner surface of the red cell membrane, and one of these minor proteins is made predominantly by reticulocytes. The glycoprotein band 3 was weak in the young RBC, which are more susceptible to the invasion by Plasmodium, therefore, it seems that susceptibility to the invasion was correlated to initial interaction parasite-host cells. Upon invasion, the parasites begin to modify the host cells structure making internal and external alterations that enable the parasite to proliferate in the host cells [114Deitsch KW, Wellems TE. Membrane modifications in erythrocytes parasitized by Plasmodium falciparum. Mol Biochem Parasitol 1996; 76(1-2): 1-10. [http://dx.doi.org/10.1016/0166-6851(95)02575-8] [PMID: 8919990] , 115Sestier C, Sabolovic D, Geldwerth D, et al. Use of annexin V-ferrofluid to enumerate erythrocytes damaged in various pathologies or during storage in vitro. C R Acad Sci III 1995; 318(11): 1141-6. [PMID: 8574791] ]. Several lines of evidence indicate that malaria parasites invade erythrocytes by binding to specific ligand erythrocyte surface [116Miller LH, Haynes JD, McAuliffe FM, Shiroishi T, Durocher JR, McGinniss MH. Evidence for differences in erythrocyte surface receptors for the malarial parasites, Plasmodium falciparum and Plasmodium knowlesi. J Exp Med 1977; 146(1): 277-81. [http://dx.doi.org/10.1084/jem.146.1.277] [PMID: 327014] , 117Mitchell GH, Bannister LH. Malaria parasite invasion: Interactions with the red cell membrane. Crit Rev Oncol Hematol 1988; 8: 225-310. [http://dx.doi.org/10.1016/S1040-8428(88)80011-8] ]. The same erythrocytes membranes proteins are conserved in mammals recognized by different species of Plasmodium. Moreover, the red blood cells of the mice can be invaded by Plasmodium falciparum [118Klotz FW, Chulay JD, Daniel W, Miller LH. Invasion of mouse erythrocytes by the human malaria parasite, Plasmodium falciparum. J Exp Med 1987; 165(6): 1713-8. [http://dx.doi.org/10.1084/jem.165.6.1713] [PMID: 3295109] ]. Plasmodium lophurae can develop in rodent erythrocytes and Plasmodium berghei can grow in duck embryos [119McGhee RB. The influence of age of the animal upon the susceptibility of mammalian erythrocytes to infection by the avian malaria parasite Plasmodium lophurae. J Infect Dis 1953; 92(1): 4-9. [http://dx.doi.org/10.1093/infdis/92.1.4] [PMID: 13022984] , 120McGhee RB. The infection of duck and goose erythrocytes by the mammalian malaria parasite, Plasmodium berghei. J Protozool 1954; 1: 145-8. [http://dx.doi.org/10.1111/j.1550-7408.1954.tb00807.x] ]. Plasmodium carries receptors on its surface for recognition and invasion of host tissue (RBC, hepatocytes). Plasmodium invasion is achieved by molecular interactions between several parasite proteins and multiple host receptors. Comparative proteomic analysis have identified multiple ligand-receptor and host-cell receptor essential for adhesion and signaling for erythrocyte invasion. The released merozoite recognizes its site and then attaches to the surface of the red blood cell, and reorients itself to put its apical region in contact with the erythrocyte to tie it. A tight junction is formed between the merozoite and the membrane which triggers the invasion process. In this process, an interaction between erythrocyte surface ligands and merozoite surface receptors is essential for the deformability of the erythrocyte plasma membrane and the internalization of merozoite in the red blood cell (Fig. 2 and Table 2). The molecular interactions of Plasmodium with host cells are mediated by thrombospondin structural repeat motif (TSR) expressed at various stages of the parasite's life cycle which are: i) the Circumsporozoite Protein (CSP) and the Thrombospondin-related Adhesive Protein (TRAP) from sporozoites ii) the Merozoite Thrombospondin-Related Anonymous Protein (MTRAP) and the Thrombospondin Related Proteins (TRAMP) from merozoites iii) the CSP TRAP Related Protein (CTRP) from ookinetes [121Siddiqui FA, Dhawan S, Singh S, et al. A thrombospondin structural repeat containing rhoptry protein from Plasmodium falciparum mediates erythrocyte invasion. Cell Microbiol 2013; 15(8): 1341-56. [http://dx.doi.org/10.1111/cmi.12118] [PMID: 23387921] ]. Parasitic proteins such as the Apical Membrane Antigen (AMA), the Rhoptry Neck complex (RON complex), the Erythrocyte Binding-Like family (EBL), the Ring-infected Erythrocyte Surface Antigen (RESA), and the Reticulocyte Binding-Like family (RBL) bind to the erythrocytic proteins such as the glycophorin A, the glycophorin C, the Duffy-Antigen Receptor for Chemokines (DARC), the Complement Receptor 1 (CR1), and the basigin (CD147) allowing the merozoite to enter the erythrocyte by the endocytosis process and forms the parasitophorous vacuole [122Perkins ME. Surface proteins of Plasmodium falciparum merozoites binding to the erythrocyte receptor, glycophorin. J Exp Med 1984; 160(3): 788-98. [http://dx.doi.org/10.1084/jem.160.3.788] [PMID: 6206188] -126Mitchell GH, Thomas AW, Margos G, Dluzewski AR, Bannister LH. Apical membrane antigen 1, a major malaria vaccine candidate, mediates the close attachment of invasive merozoites to host red blood cells. Infect Immun 2004; 72(1): 154-8. [http://dx.doi.org/10.1128/IAI.72.1.154-158.2004] [PMID: 14688092] ]. The Rhoptry-Associated Membrane Antigen (RAMA) and the Rhoptry-Associated-Protein (RAP) integrate into the inner leaflet of the plasma membrane then binding specifically PS and PI to initiate the formation of the parasitophorous vacuole [127Joiner KA. Rhoptry lipids and parasitophorous vacuole formation: A slippery issue. Parasitol Today (Regul Ed) 1991; 7(9): 226-7. [http://dx.doi.org/10.1016/0169-4758(91)90232-D] [PMID: 15463503] -131Perkins ME, Rocco LJ. Sialic acid-dependent binding of Plasmodium falciparum merozoite surface antigen, Pf200, to human erythrocytes. J Immunol 1988; 141(9): 3190-6. [PMID: 2459245] ]. During parasitic invasion, erythrocyte membranes interact with multiple parasitic ligands such as the high molecular mass Rhoptry Protein (RHOP-H), the Plasmodium falciparum Rhoptry neck Protein (PfAARP), the Serine Repeat Antigen (SERA), the Mature parasite-infected Erythrocyte Surface Antigen (MESA), the Erythrocyte Binding Antigen (EBA), and the Merozoite Surface Protein (MSP-1). The synthesis of the glycoprotein Plasmodium falciparum Merozoite Surface (PfMSP) proceeds from schizogony to the release of merozoites. During the maturation of the merozoite, PfMSP degrades into several fragments. Anti-PfMSP antibodies inhibit the maturation of Plasmodium falciparum in culture [132Holder AA, Guevara Patino JA, Uthaipibull C, et al. Merozoite surface protein 1, immune evasion, and vaccines against asexual blood stage malaria Parassitologia 1999; 41: 409-14.-136Brown GV, Culvenor JG, Crewther PE, et al. Localization of the ring-infected erythrocyte surface antigen (RESA) of Plasmodium falciparum in merozoites and ring-infected erythrocytes. J Exp Med 1985; 162(2): 774-9. [http://dx.doi.org/10.1084/jem.162.2.774] [PMID: 3894564] ]. The parasitic factors secreted by the apical organelles of merozoites such as micronemes, rhoptries, and dense granules are used for the invasion of erythrocytes. These ligands include: i) the Plasmodium vivax reticulocyte binding proteins family (PvRBP) and the Plasmodium falciparum reticulocyte-binding protein homologue family (PfRH) present in rhoptries ii) the EBA family and the EBL family present in micronemes [137Cowman AF, Crabb BS. Invasion of red blood cells by malaria parasites. Cell 2006; 124(4): 755-66. [http://dx.doi.org/10.1016/j.cell.2006.02.006] [PMID: 16497586] -139Camus D, Hadley TJ. A Plasmodium falciparum antigen that binds to host erythrocytes and merozoites. Science 1985; 230(4725): 553-6. [http://dx.doi.org/10.1126/science.3901257] [PMID: 3901257] ]. During the invasion of reticulocytes by Plasmodium vivax, PvRBPs are essential for the interaction of the parasite with membrane proteins of reticulocytes [140Li J, Han ET. Dissection of the Plasmodium vivax reticulocyte binding-like proteins (PvRBPs). Biochem Biophys Res Commun 2012; 426(1): 1-6. [http://dx.doi.org/10.1016/j.bbrc.2012.08.055] [PMID: 22925889] ]. Basigin, a multifunctional transmembrane glycoprotein, is the erythrocyte receptor for PfRh5 [141Muramatsu T, Miyauchi T. Basigin (CD147): A multifunctional transmembrane protein involved in reproduction, neural function, inflammation and tumor invasion. Histol Histopathol 2003; 18(3): 981-7. [PMID: 12792908] -144Miyauchi T, Kanekura T, Yamaoka A, Ozawa M, Miyazawa S, Muramatsu T. Basigin, a new, broadly distributed member of the immunoglobulin superfamily, has strong homology with both the immunoglobulin V domain and the beta-chain of major histocompatibility complex class II antigen. J Biochem 1990; 107(2): 316-23. [http://dx.doi.org/10.1093/oxfordjournals.jbchem.a123045] [PMID: 2361961] ]. 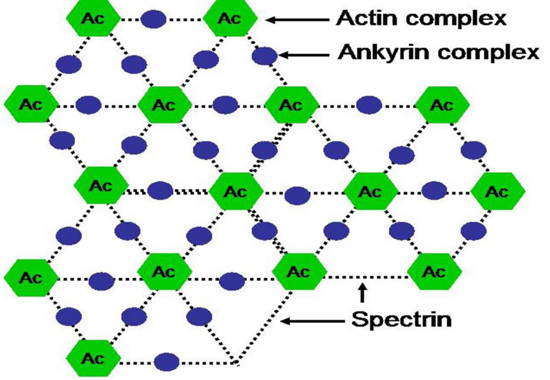 The spectrin chain forms a hexagonal lattice centered around Actin complex (Ac). The actin complex and the ankyrin complex link spectrin chains to a complex of band 3 and other proteins in the lipid bilayer. Ankyrin links spectrin to a complex of band 3 (SLC4A1) protein and other proteins in the lipid bilayer. Protein 4.2 binds ankyrin, band 3, CD47 and spectrin. Band 3 protein, an anion-exchange channel, also is associated with glycophorins, blood group proteins Rh, LW and stomatin which interacts with aquaporin, a water channel. 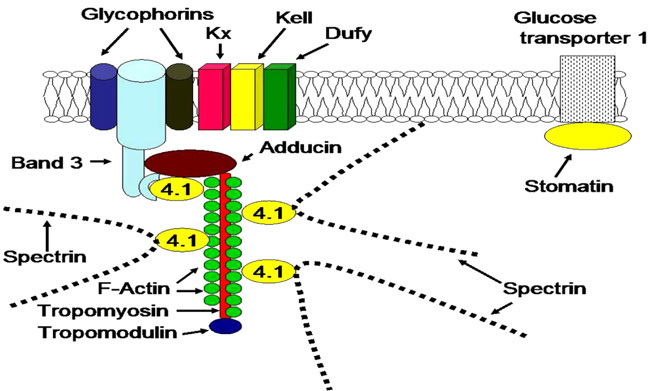 The protein 4.1 links F-actin to spectrin chains and in association with adducin to band 3 (SLC4A1) protein, which is an anion-exchange channel. The actin junctional complex also contains the blood group proteins Kx/Kell and DARC/Duffy as well as glycoproteins and enzymes in the glycolytic metabolon. Stomatin interacts with glucose transporter 1, aquaporin and band 3 protein. During hematopoiesis, the erythroblast loses its nucleus and all its cytoplasmic organelles degenerate during maturation to become reticulocyte. The ultimate stages of maturation take place in the peripheral circulation or in the spleen. RBC undergo complex cellular remodeling during the maturation of polychromatic stages to orthochromatic stages. In two to three days, gradually losing ribosomal material and mitochondria, the reticulocyte is transformed into a mature erythrocyte. During the maturation process, reticulocytes lose organelles, water, and membranes. Their polysomes begin to separate into monosomes, then monosomes decrease and disappear [94Chang H, Langer PJ, Lodish HF. Asynchronous synthesis of erythrocyte membrane proteins. Proc Natl Acad Sci USA 1976; 73(9): 3206-10. [http://dx.doi.org/10.1073/pnas.73.9.3206] [PMID: 1067613] -98Marks PA, Rifkind RA, Danon D. Polyribosomes and protein synthesis during reticulocyte maturation in vitro. Proc Natl Acad Sci USA 1963; 50: 336-42. [http://dx.doi.org/10.1073/pnas.50.2.336] [PMID: 14060653] ]. Because of the lifespan of the RBC of about 120 days, the reticulocytes constitute a little less than 1% of all RBC in circulation [176Recommended method for radioisotope red-cell survival studies. Br J Haematol 1980; 45(4): 659-66. [http://dx.doi.org/10.1111/j.1365-2141.1980.tb07189.x] [PMID: 7426443] , 177Wajcman H, Lantz B, Girot R. Les maladies du globule rouge 1992.]. Susceptibility to parasitic invasion is linked to the terminal stages of the differentiation of RBC. Erythroblast cells are refractory to an invasion. Polychromatic cells are poorly invaded since the ring stage of Plasmodium is less abundant there. Early orthochromatic erythroblasts are the first stages invaded by Plasmodium because the ring stage of Plasmodium is abundant and there are fewer trophozoites there. Late-stage orthochromatic cells and nascent reticulocytes are susceptible to the intracellular growth of the parasite because the intracellular maturation of Plasmodium can be at the trophozoite stages and schizont stages [178Tamez PA, Liu H, Fernandez-Pol S, Haldar K, Wickrema A. Stage-specific susceptibility of human erythroblasts to Plasmodium falciparum malaria infection. Blood 2009; 114(17): 3652-5. [http://dx.doi.org/10.1182/blood-2009-07-231894] [PMID: 19706885] ]. The parasite uses erythrocyte hemoglobin as a nutritional source for its development inside the erythrocytes [179Ashong JO, Blench IP, Warhurst DC. The composition of haemozoin from Plasmodium falciparum. Trans R Soc Trop Med Hyg 1989; 83: 167-72.]. The age classes of RBC constitute one of the constraints of the growth of Plasmodium population. The RBC preference is always enigmatic since the classification of different stages of reticulocyte maturation is limited by technical approaches [180Jensen WN, Moreno GD, Bessis MC. An electron microscopic description of basophilic stippling in red cells. Blood 1965; 25: 933-43. [PMID: 14294770] , 181Bessis M, Breton-Gorius J. Le reticulocyte. Coloration vitales et microscopie électronique. Nouv Rev Fr Hematol 1964; 4: 77-94. [PMID: 14122854] ]. Plasmodium species have different preferences for RBC invasion. Plasmodium vivax and Plasmodium ovale have a preference for reticulocytes related to the high density of Duffy antigen [182Woolley IJ, Hotmire KA, Sramkoski RM, Zimmerman PA, Kazura JW. Differential expression of the duffy antigen receptor for chemokines according to RBC age and FY genotype. Transfusion 2000; 40(8): 949-53. [http://dx.doi.org/10.1046/j.1537-2995.2000.40080949.x] [PMID: 10960522] ]. Red blood cells deficient in antigens of blood group Duffy are resistant to invasion by Plasmodium kmowlesi and Plasmodium vivax. Plasmodium vivax and Plasmodium ovale parasitize young red blood cells. Plasmodium malariae would rather parasite old red blood cells. The preference of Plasmodium malariae for mature red blood cells is related to the senescence of markers. For Plasmodium falciparum, its affinity seems to be for RBC of all ages but has an apparent preference for young red blood cells [183Omodeo-Salè F, Motti A, Basilico N, Parapini S, Olliaro P, Taramelli D. Accelerated senescence of human erythrocytes cultured with Plasmodium falciparum. Blood 2003; 102(2): 705-11. [http://dx.doi.org/10.1182/blood-2002-08-2437] [PMID: 12649148] , 184Pasvol G, Weatherall DJ, Wilson RJ. The increased susceptibility of young red cells to invasion by the malarial parasite Plasmodium falciparum. Br J Haematol 1980; 45(2): 285-95. [http://dx.doi.org/10.1111/j.1365-2141.1980.tb07148.x] [PMID: 7002199] ]. The aging of red blood cells decreases susceptibility to Plasmodium invasion due to the disappearance of membrane antigens [185Silvestre D, Kourilsky FM, Nicolai MG, Levy JP. Presence of HLA antigens on human reticulocytes as demonstrated by electron microscopy. Nature 1970; 228(5266): 67-8. [http://dx.doi.org/10.1038/228067a0] [PMID: 5460343] , 186Wilson RJ, Pasvol G, Weatherall DJ. Invasion and growth of Plasmodium falciparum in different types of human erythrocyte. Bull World Health Organ 1977; 55(2-3): 179-86. [PMID: 338178] ]. Most rodent Plasmodium has a preference for young red blood cells. Electrophoresis of cells membranes and Giemsa-Cresyl staining show that young erythrocytes are more susceptible to invasion by Plasmodium berghei ANKA. This RBC population is similar to that obtained 4 days after mice bleeding. Plasmodium berghei ANKA exhibits a specificity for this young RBC rather than for young reticulocytes or adult RBC. Two days after the infestation of the C57BL/6 mice by Plasmodium berghei ANKA, the young RBC appear. This young RBC increases progressively till it becomes a maximum of 40% of the total red blood cells population the fifth day after infestation [187Moumaris M, Danis M. Membranes érythrocytaires dans le paludisme: modèle d'étude: Souris - Plasmodium berghei ANKA. Paris: [SI] [sn] 1996.]. The membrane proteins profile of young cells is different compared to adult erythrocyte. Membrane proteins profiles obtained by coomassie blue coloration show the presence of classical integral and cytoskeletal proteins of erythrocytes (lane 1). This profile is not significantly modified in adult erythrocyte from 4-5 days after infestation of mice or 4 days after bleeding of mice (lane 2, lane 3). The more susceptible the cells to invasion and the young erythrocytes (lane 4, lane 5) show a largely modified protein composition, for example, bands 2-1 (ankyrin) and 4-9 (demantin) are more abundant compared to adult red blood cells. In contrast, the level of glycoprotein band 3 is very weak, so in the recognition invasion process of Plasmodium berghei ANKA for mice, the presence of a glycoprotein band 3 does not seem to be required (Fig. 6 ). The Giemsa-Cresyl double staining identifies the ribosomes and the parasite Plasmodium berghei ANKA in a different stage of RBC maturation. Observation by light microscopy of blood cells stained by Giemsa-Cresyl shows that the erythrocytes can be divided into four classes as follows: i) The youngest includes cells that stain cytosol polysome ii) The medium age includes cells stained with a medium cytosol monosome iii) The advanced age includes cells stained with a weak cytosol monosome iv) The mature RBC includes cells that stain negatively for Cresyl. The Giemsa-Cresyl demonstrated that young RBC having a preference from Plasmodium berghei ANKA are more susceptible to invasion by Plasmodium berghei ANKA than mature RBC. The Giemsa-Cresyl double staining identifies the parasite among the youngest RBC, the medium age RBC, the advanced age RBC and the mature RBC. The Giemsa-Cresyl locates the Plasmodium berghei ANKA predominates in the RBC with medium age (Fig. 7 ). The preferential RBC invasion occurs through specific interactions between RBC and Plasmodium [188Kerlin DH, Gatton ML. Preferential invasion by Plasmodium merozoites and the self-regulation of parasite burden. PLoS One 2013; 8(2): e57434. [http://dx.doi.org/10.1371/journal.pone.0057434] [PMID: 23460855] , 189McQueen PG, McKenzie FE. Age-structured red blood cell susceptibility and the dynamics of malaria infections. Proc Natl Acad Sci USA 2004; 101(24): 9161-6. [http://dx.doi.org/10.1073/pnas.0308256101] [PMID: 15178766] ]. The great majority of total RBC surface carbohydrate include more than 90% of the sialic acid and therefore most of the negative charges of the surface are carried by glycophorins [190Olden K, Bernard BA, Humphries MJ, et al. Function of glycoprotein glycans. Trends Biochem Sci 1985; 10: 78-82. [http://dx.doi.org/10.1016/0968-0004(85)90238-5] ]. The merozoite recognition and invasion are sugar dependent, based on the utilization of fluorescent neoglycoproteins at the endoerythrocytic stage of rodent Plasmodium berghei [191Schrevel J, Philippe M, Bernard F, Monsigny M. Surface Plasmodium sugar-binding components evidenced by fluorescent neoglycoproteins. Biol Cell 1986; 56(1): 49-55. [http://dx.doi.org/10.1111/j.1768-322X.1986.tb00442.x] [PMID: 2941097] ]. Differences in membranes cell charge correlated with the oligosaccharide structure linked to glycoprotein could explain the parasite's preference for young rather than old cells. In-vivo study model “mice - Plasmodium berghei ANKA” shows different membrane proteins profiles of RBC. Reticulocytosis was induced in C57BL/6 mice by removal of 35% of the blood volume by bleeding. The blood containing an average of 25% reticulocytes was harvested 1 day later. Cells were separated over the gradient of Percoll, purchased from Sigma Saint-Quentin Fallavier France, at 600 g for 20 min. In line 1, there is erythrocytes control ; in line 2, there are erythrocytes from 5 days after the infestation of mice ; in line 3, there are erythrocytes from 5 days after bleeding of mice ; in line 4, there are young erythrocytes from 5 days after the infestation of mice ; in line 5, there are young erythrocytes from 5 days after bleeding of mice. The cells were lysed in hypotonic phosphate buffer containing inhibitors of protease as pepstatin and aprotinin. The suspension was centrifuged at 13000 g for 15 min. The membrane was solubilized in 60 mM Tris-buffer pH 6.8, 5% 2-mercaptoethanol, 2% SDS and 10% glycerol, purchased from Sigma Saint-Quentin Fallavier France, then incubated for 3 min at 100 °C. 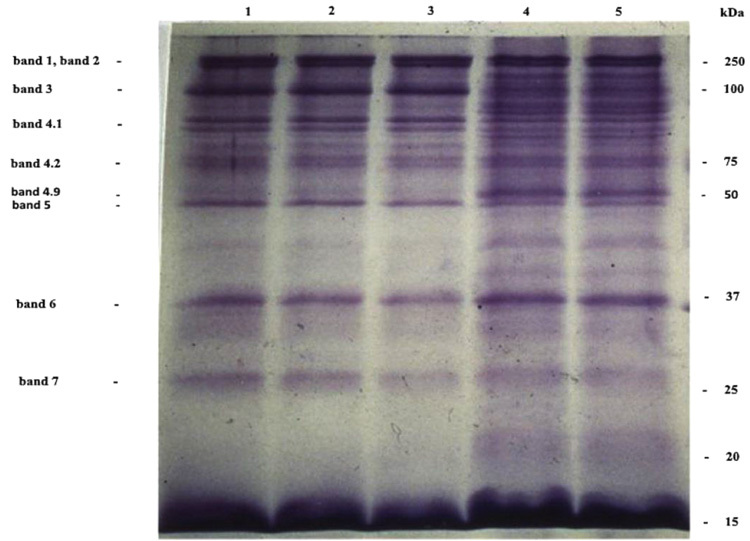 Proteins membranes at 15 µg were separated by 15% SDS-PAGE electrophoresis and stained with Coomassie Brilliant Blue R-250, purchased from Sigma Saint-Quentin Fallavier France [Moumaris et al., 1996]. Different methods of diagnosing malaria have been developed, including parasitological, immunological and molecular biology techniques. Parasitological methods involve microscopic blood smear examination for the detection of Plasmodia. Immunological methods involve examination using immunoassays and flow cytometry techniques to detect Plasmodia antibodies and antigens. PCR methods are more sensitive and specific in identifying Plasmodia species [192Johnston SP, Pieniazek NJ, Xayavong MV, Slemenda SB, Wilkins PP, da Silva AJ. PCR as a confirmatory technique for laboratory diagnosis of malaria. J Clin Microbiol 2006; 44(3): 1087-9. [http://dx.doi.org/10.1128/JCM.44.3.1087-1089.2006] [PMID: 16517900] , 193Grimberg BT. Methodology and application of flow cytometry for investigation of human malaria parasites. J Immunol Methods 2011; 367(1-2): 1-16. [http://dx.doi.org/10.1016/j.jim.2011.01.015] [PMID: 21296083] ]. Vector control by treatment with insecticides as pyrethroids allowed the prevention of malaria, however, the resistance of the anopheles renders this prophylaxis ineffective. Chemotherapy has long been used, with natural antimalarials drugs as quinine extracted from cinchona bark and then with synthetic antimalarials as chloroquine, pyrimethamine, proguanil, mefloquine, and malarone. Chemo-resistance makes these drug treatments less effective; this resistance is mainly through biological membranes and metabolic pathways [194Bryskier A, Labro MT. Paludisme et médicaments 1988.-196Staines HM, Burrow R, Teo BH, Chis Ster I, Kremsner PG, Krishna S. Clinical implications of Plasmodium resistance to atovaquone/proguanil: A systematic review and meta-analysis. J Antimicrob Chemother 2017; 73: 581-95. [http://dx.doi.org/10.1093/jac/dkx431] [PMID: 29237012] ]. The malarial vaccine provides protection against infection [197Alonso PL, Sacarlal J, Aponte JJ, et al. Duration of protection with RTS,S/AS02A malaria vaccine in prevention of Plasmodium falciparum disease in Mozambican children: single-blind extended follow-up of a randomised controlled trial. Lancet 2005; 366(9502): 2012-8. [http://dx.doi.org/10.1016/S0140-6736(05)67669-6] [PMID: 16338450] -199Olotu A, Lusingu J, Leach A, et al. Efficacy of RTS,S/AS01E malaria vaccine and exploratory analysis on anti-circumsporozoite antibody titres and protection in children aged 5-17 months in Kenya and Tanzania: A randomised controlled trial. Lancet Infect Dis 2011; 11(2): 102-9. [http://dx.doi.org/10.1016/S1473-3099(10)70262-0] [PMID: 21237715] ]. Several approaches in the development of a malaria vaccine have been considered: i) the parasite dead or attenuated ii) CSP derived antigens to prevent hepatocyte infestation iii) the anti-merozoite vaccine against antigenic proteins of merozoites such as the MSP iv) the anti-gametocyte vaccine to interrupt mosquito transmission and subsequent contamination of other subjects v) the multicomponent vaccine to inhibit the development of the parasite from the sporozoite stage to merozoite stage vi) the vaccines reconstituted by synthesis [200Alonso PL, Sacarlal J, Aponte JJ, et al. Efficacy of the RTS,S/AS02A vaccine against Plasmodium falciparum infection and disease in young African children: Randomised controlled trial. Lancet 2004; 364(9443): 1411-20. [http://dx.doi.org/10.1016/S0140-6736(04)17223-1] [PMID: 15488216] -206Shi YP, Hasnain SE, Sacci JB, et al. Immunogenicity and in vitro protective efficacy of a recombinant multistage Plasmodium falciparum candidate vaccine. Proc Natl Acad Sci USA 1999; 96(4): 1615-20. [http://dx.doi.org/10.1073/pnas.96.4.1615] [PMID: 9990073] ]. The host-targeted therapeutics for malaria has been identified in the process used by Plasmodium to invade erythrocytes. Merozoite surface proteins and those secreted by its apical organelles are involved in the process of erythrocyte invasion ; they are vaccine candidates and drug targets against malaria. A malaria vaccine candidate targets PfRh5, MSP-1, AMA-1, and EBA-175 [207Muramatsu T. Basigin: A multifunctional membrane protein with an emerging role in infections by malaria parasites. Expert Opin Ther Targets 2012; 16(10): 999-1011. [http://dx.doi.org/10.1517/14728222.2012.711818] [PMID: 22880881] ]. Invasion assays have been developed for primate malaria. A successful vaccine would be a combination of antigens involved in invasion. Proteomic and transcriptomic data of parasites show that malaria proteins have large polymorphism strategies against the host immune mechanisms [208Bozdech Z, Llinás M, Pulliam BL, Wong ED, Zhu J, DeRisi JL. The transcriptome of the intraerythrocytic developmental cycle of Plasmodium falciparum. PLoS Biol 2003; 1(1): E5. [http://dx.doi.org/10.1371/journal.pbio.0000005] [PMID: 12929205] -210Rich SM, Ferreira MU, Ayala FJ. The origin of antigenic diversity in Plasmodium falciparum. Parasitol Today 2000; 16: 390-6.]. The protective polymorphism against malaria is manifested in: i) malaria susceptibility genes as HLA, ICAM, and CD36 ii) structural proteins as hemoglobin and duffy antigen iii) erythrocytic enzymes as G6PD and PK. Erythrocyte mutation of band 3 in ovalocytosis, of ankyrin in spherocytosis, of spectrin in elliptocytosis, or of protein 4.1 have a resistance effect against Plasmodium [211Min-Oo G, Gros P. Erythrocyte variants and the nature of their malaria protective effect. Cell Microbiol 2005; 7(6): 753-63. [http://dx.doi.org/10.1111/j.1462-5822.2005.00524.x] [PMID: 15888079] ]. Two distinct hosts and several stages of the life cycle make the host-Plasmodium interaction complex, generating molecular variants that exert resistance effects of this host-parasite interaction. The realization of an effective malaria vaccine remains a difficult prospect linked to epidemiology, antigenic variations and genomic polymorphism of the parasite. Vector control, drugs, and transfusion remain the curative and prophylactic treatment in the medium term. SDS-PAGE electrophoresis of erythrocytes membranes proteins. A representative young erythrocyte infested with Plas-modium at trophozoite stage: study model “mice Plasmodium berghei ANKA” (100X). Females C57BL/6 mice 8 weeks old weighing 20 g were purchased from Charles River Laboratoires Saint-Aubin-lès-Elbeuf France. These mice were either exposed to the bites of female anopheles mosquitoes infected by Plasmodium berghei ANKA or injected intraperitoneally with RBC infected by Plasmodium berghei ANKA. Blood was enriched with young RBC by bleeding these mice. The fresh blood obtained 5 days after the infestation of mice was incubated with reagent Cresyl RAL which was purchased from Rhône Poulenc, to cause the ribosomes in the young blood cells to appear. Then the Giemsa reagent RAL 555 which was purchased from Prosciences France, was applied to visualize the parasite in the RBC. The yellow arrow shows youngest RBC, the blue arrow indicates medium age RBC parasitized by Plasmodium berghei ANKA, the green arrow shows advanced age RBC, and the red arrow indicates mature RBC [Moumaris et al., 1996]. Currently, to struggle against malaria there are medicines, the eradication of mosquitoes and the prevention of mosquito bites (mosquito nets). Several drugs are used such as quinine, chloroquine, mefloquine, amodiaquine, pyrimethamine, doxycycline, sulfadoxine, dapsone, proguanil, atovaquone, and artemisinin-based combination therapy. All these drugs are confronted with parasitic drug resistance. Biological membranes have a major role in host cells invasion by Plasmodium. Membrane carbohydrates, proteins, and lipids are essential for the malaria parasite invasion. The preferential cells invasion occurs through specific interactions between cells and Plasmodium. Plasmodium recognizes specific receptor of host cells and enters these cells to develop. Plasmodium invasion is achieved by molecular interactions between several parasitic ligands and multiple host receptors on the biological membranes. At the moment, there is no vaccine against malaria, but there are vaccine candidates in development. The realization of an effective malaria vaccine will be confronted with the complex interactions between biological membranes and malaria parasites. UPMC = Université Pierre et Marie Curie Paris. We thank Monique Abuaf and Suzanne Nazabal AP-HP. We thank Said Youssouf Chanfi UPMC and Bernard Lebeau AP-HP. This work was supported by Association Recherche et Développement Biomédical. Ebbell B, Banov L. The Papyrus Ebers: The greatest Egyptian medical document 1937. Jones WHS. Malaria and Greek history 1909. Ambroise TP, Carnevale P, Felix H, Mouchet J. Le Paludisme 1984. Laveran A. Description d’un nouveau parasite découvert dans le sang des malades atteints de fièvre palustre. C R Acad Sci Paris 1881; 93: 627-30. Laveran A. Nature parasitaire des accidents de l’impaludisme: description d’un nouveau parasite trouvé dans le sang des malades atteints de fièvre palustre 1881. Laveran A. Note sur un nouveau parasite trouvé dans le sang de plusieurs malades atteints de fièvre palustre. Bull Acad Med Paris 1880; 9: 1235-6. Garnham PCC. Malaria parasites and other haemosporidia 1966. Aikawa M. Variations in structure and function during the life cycle of malarial parasites Bull World Health Organ 1977; 55: 139-56. Peters W, Richards WHG. Antimalarial drugs 1984. Ratnoff OD, Forbes CD. Disorders of Hemostasis 1984. Williams WJ, Beutler E, Erslev AJ, Lichtman MA. Hematology 1983. Raventos-Suarez C, Kaul DK, Macaluso F, Nagel RL. Membrane knobs are required for the microcirculatory obstruction induced by Plasmodium falciparum-infected erythrocytes Proc Natl Acad Sci U S A 1985; 82: 3829-3. Aggarwal BB, Eessalu TE, Hass PE. Hass PE. Characterization of receptors for human tumour necrosis factor and their regulation by gamma-interferon Nature 1985; 318: 665-7. Renooij W, Van Golde LM, Zwaal RF, Van Deenen LL. Topological asymmetry of phospholipid metabolism in rat erythrocyte membranes Evidence for flip-flop of lecithin Eur J Biochem 1976; 61: 53-8. Ciba Foundation Symposium. Malaria and the Red Cell Pitman, London: David Evered and Julie Whelan 1983. The Red Blood Cell New York: Douglas Surgenor 1974. Ansell GB, Hawthorne JN, Dawson RMC. Form and function of phospholipids 1973. Fasman GD. Handbook of biochemistry and molecular biology 1976. Alberts B. Molecular biology of the cell 2015. Perkins M. Inhibitory effects of erythrocyte membrane proteins on the in vitro invasion of the human malarial parasite (Plasmodium falciparum) into its host cell J Cell Biol 1981; 90: 563-7. Holder AA, Guevara Patino JA, Uthaipibull C, et al. Merozoite surface protein 1, immune evasion, and vaccines against asexual blood stage malaria Parassitologia 1999; 41: 409-14. Stibenz D, Brox D, Geyer G. Protein changes of the erythrocyte membrane during blood preservation. Folia Haematol Int Mag Klin Morphol Blutforsch 1980; 107: 459-71. Wajcman H, Lantz B, Girot R. Les maladies du globule rouge 1992. Ashong JO, Blench IP, Warhurst DC. The composition of haemozoin from Plasmodium falciparum. Trans R Soc Trop Med Hyg 1989; 83: 167-72. Moumaris M, Danis M. Membranes érythrocytaires dans le paludisme: modèle d'étude: Souris - Plasmodium berghei ANKA. Paris: [SI] [sn] 1996. Bryskier A, Labro MT. Paludisme et médicaments 1988. Rich SM, Ferreira MU, Ayala FJ. The origin of antigenic diversity in Plasmodium falciparum. Parasitol Today 2000; 16: 390-6.